Growing hops, in pots, in Houston. I actually almost grabbed this little guy by accident when I was adjusting some of the bines and wrapping them back around the twine. 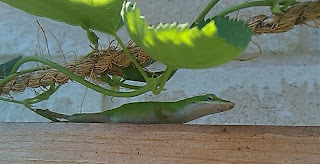 He's taken up residence on my hop trellis and a welcome addition if he eats the bugs and not the hops. Most of the bines on the Cascade plant have recently gone through a big growth spurt. After a couple of weeks of very little growth, a few of bines have now reach the end of the twine. I've also picked a handful of hop cones that looked and felt like they were ready. I dried them inside and then sealed them in an airtight bag the freezer. I haven't seen the same growth spurt of the bines on the Nugget, but it is starting to grow more sidearms which is what it did last year. The hop cones developed in cluster off the sidearms unlike the Cascade that just grow along the entire length of the bine. There are a few hop cones that have developed, but nothing really working picking yet. The temperatures are now regularly getting into the 90's during the day with the heat index climbing over 100 a few times. In other words, I think its time to move the plants around the corner to the East side of the house so that they're in the shade during the hottest time of the day. They'll get the morning sun until about one o'clock when they'll fall into the shade of the house. Like drinking, brewing and generally enjoying good beer? Check out my other blog at http://www.allgoodbeer.com.